Care is better than cure, consult one of gum treatment specialist at Bright Smile Dental Clinic now and take care of your dental hygiene. Our mouths are full of bacteria. These bacteria, along with mucus and other particles, constantly form a sticky, colorless "plaque" on teeth. Brushing and flossing help get rid of plaque. Plaque that is not removed can harden and form bacteria-harboring "tartar" that brushing doesn't clean. Only a professional cleaning by a dentist or dental hygienist can remove tartar. 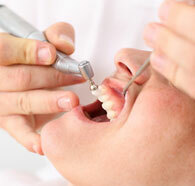 Contact one of our dentist who are highly experinenced in the treatment of gums. The longer plaque and tartar stays on the teeth, the more harmful they become. The bacteria cause inflammation of the gums that is called "gingivitis." In gingivitis, the gums become red, swollen and can bleed easily. Gingivitis is a mild form of gum disease that can usually be reversed with daily brushing and flossing, and regular cleaning by our dentist or dental hygienist. This form of gum disease does not include any loss of bone and tissue that hold teeth in place. Call us to discuss the procedures for gum disease treatment. ​Contact one of our dentist at Bright Smile Dental and Orthodontic Center in Jumierah on Al Wasl road for your gum treatment.